Pop Goes the Library: Hate Mail! And now, hate mail (scroll down to where it says "No Smoking!"). Clearly, my work here is very far from done. I saw that letter to the editor about your picture (which is everything you said it is--cute, sassy, etc.) --and as Meg Ryan said in Joe Versus the Volcano, "I have no response to that." John Berry called me to ask for my response to it -- at least they ran it with a corrective comment! And also: thanks re: the photo. I may love the photo on the TOC even more than the one they ran with my profile. Steve, my Dad took me to see R.E.M. a few months after the ill-fated Replacements gig. I think my husband would give his eye teeth to have attended the show you saw, though! Come to think of it, he probably has a bootleg copy of the show on cassette (and possibly on CD) somewhere. Sad 2: That Ms. Skiles felt that her upset warranted a public scolding; enough so that she invested the time and energy to write a letter about it. Sad 3: That LJ chose to print that letter. If they got 100 such letters and felt that they needed to print one to fairly represent a generally expressed sentiment I could understand. I'm guessing that's not the case, and I find myself feeling a bit bad for scoldy Ms. Skiles, her scoldiness exposed for all to see. But I guess she made her bed, lumpy mattress, hospital corners and all, and now she must lie in it. In an unrelated development, I want to comment on Melissa's comment and say, ohmygod, Joe versus the Volcano is one of my favorite movies and I don't understand why it is held in such generally low regard (if it's regarded at all.) "Very interesting...As a luggage problem." If that ain't genius, I just don't know what is. You know, I always read the LJ letters, and I always think, what a dumb@$$. This won the out-of-touch and hysteric librarian award, though. Close runner-ups are any "I hate the bun stereotype" letters I read when I'm rocking a bun that day. 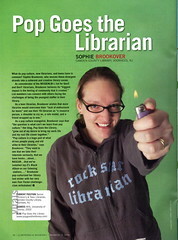 Oh, I thought you were promoting book-burning--not smoking. That really IS bad, you ought to be ashamed! I guess this isn't the time to make a joke about being inspired to smoke, since all the cool kids are? First concert? Hhmmm.... OK. The Bee Gees. It was a friend's 13th birthday, I believe, Madison Square Garden. My most recent concert? Harry and the Potters. Sophie, I talk up that REM concert while playing down the Styx "Mr. Roboto" show that I saw the previous year. Dad took me to that one, too.